← Can tigers swim and can tigers climb trees? The Tiger chuff is a close-range sound and an integral part of the tiger’s greeting behaviour. Tigers have several vocalisations (sounds) which function in close-range situations for greeting, appeasement, aggression and reassurance. The friendly sounds at close range include, as mentioned, the chuff and also the grunt. The chuff is also, rather confusingly, described as the prusten.. They are, as I understand it, one and the same sound. The chuff or prusten is a staccato puffing sound. It is produced by the forced exhalation of air through the nostrils and mouth. This results in a fluttering action of the lips. Tigresses use friendly sounds most often with their young. This is to maintain contact with them and to give them instructions. Both tigers and tigresses produce these close range vocalisations during courtship and mating. 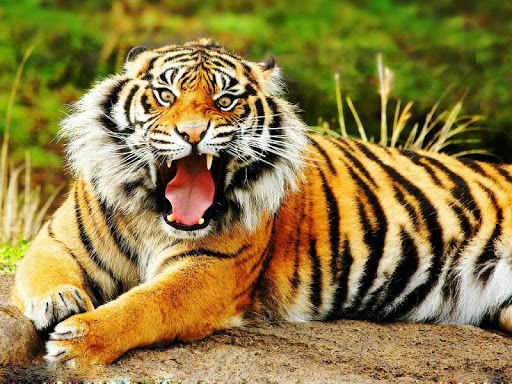 Associated post: the tiger roar. This entry was posted in Tiger and tagged cat vocalisations, tiger, tiger sounds, vocalisations by Michael Broad. Bookmark the permalink.